Former Bath, England and Lions centre Jeremy Guscott is here to answer your rugby union questions after the latest round of World Cup pool games in New Zealand. If you have any questions for Jeremy, please use the postform on this page. He will answer as many as possible next week, but unfortunately not every question submitted can be used. This week's answers appear below. What went wrong for Scotland against Argentina? They should have won once they went six points ahead against an Argentina side who never looked like scoring a try. Hi Rob, I agree, once Scotland had gone six points ahead they should have shut the door on the Argentines, they left it open and got burgled. Good, experienced sides have that ability to close games out. Scotland continued to play rugby in their own half when they should have just kicked, chased, defended and played territory rugby. So yet another heart-wrenching performance from Scotland, proving they are still the best at snatching failure from the jaws of victory - I'll be having nightmares for the next two weeks. Given the unlikelihood that Scotland will reach the quarter-finals now, do you think Scottish rugby will ever recover and get back to the glory days? Or like me, do you think it's only going to get worse? Hi Neil, thankfully, while there will be some mental scars, the Scottish team still believe they have a good chance of qualification. It has been mentioned that Andy Robinson has a few surprises for the England team. I can't wait to see them. England are by no means the best side in this competition, but it's not going to be easy for Scotland to beat them. Given England's erratic form, can a desperate Scotland beat a complacent England? With Scotland losing to Argentina, making their match against England a must win if they want to qualify, and England's improved performance against Romania, who do you believe will win next week in Auckland? Jeremy, what chance have Scotland got against England especially as they find it very difficult to score tries when up against quality teams? Hi Lance, Tom & Stephen. Andy Robinson will be working hard all this week getting Scotland mentally ready to play and beat England. Personally I think it's a big ask for Scotland to do the job against England, but this is knockout rugby now and it affects teams in strange ways. I'll be doing an analysis piece later this week on England v Scotland on the website. Hi Jeremy, what's all the fuss for the Scotland-England game? As far as I see it, England have won the pool and Argentina are runners-up. The only mathematical way this scenario won't happen is for England to fail to get at least a losing bonus point against Scotland, who can only stay in if they score four tries anyway. Whatever happens, only four teams will have made every single quarter-final in World Cup history - Scotland's proud record of reaching the knock-out stage at every RWC is now unfortunately over. Hi Eric, there's a lot of attention surrounding this game, because although there are favourites and sometimes things seem impossible, this is sport and anything can happen. I've said earlier, strange things happen to teams and individuals in pressure situations. England won't be thinking "as long as we get a losing bonus point we've qualified". They need to go out and win the game just as Scotland need to by gaining a bonus point and denying England one. This match could be a very tense affair, especially if Scotland can get a good start. Which of the current England players would you say are world class, and if so who and why? 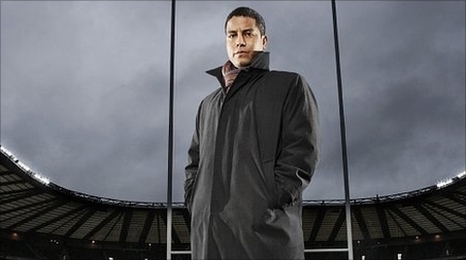 Hi Colin, in all honesty, at this moment in time, none of the England players would make my World XV team. I would expect that to change over the next few years. Players like Lawes, Youngs and Tuilagi have the potential to be world class. In four years' time there's going to be some serious talent on display when you consider the young talent already in teams like Wales and Australia. With Andrew Sheridan ruled out and Alex Corbisiero with a twitching calf, is Thomas Waldrom - a number eight - really a good choice as a replacement, leaving us with only four props? Don't get me wrong, I'm a Leicester fan and believe we need an out and out eight in the match 22, but I fear our options at one and three are too limited. Hi Kevin, from here on in it's pretty much knockout rugby for England with a game every week. I think four props is enough. If there are injuries Martin Johnson can still call another prop up. Dear Jeremy, isn't there a better replacement than Waldrom? He is a good player but I would have gone for Harlequins back rower Chris Robshaw, what do you think? Hi Jamie, if pushed I'd have to go with Martin Johnson and his decision to bring in Waldrom. I think right now he's better than Chris Robshaw and will fit in quicker if needed with the likes of Cole, Deacon, Croft and Youngs. I'm sure if Robshaw continues as he finished last season and has started this one he will be pushing these guys very close for inclusion into the squad for the Six Nations. Selection is very subjective. You're just not going to please some players and their supporters. Hi Jerry, although this might sound biased coming from a Welshman, I wanted to know whether you thought the praise England received for their win against Romania was truly justified? Yes, they got the basics right and their discipline was improved, but they were up against a weak Romanian side, so therefore their patience and discipline was not really tested, especially at the breakdown. Hi James, England's performance was better than their previous two even taking into account it was Romania and they were expected to beat them comfortably. England haven't lived up to expectations of late and I guess some of the media, not all, might have got a bit carried away. England did what was required against Romania and we will now see what this England team is made of given the expectation is for them to beat Scotland at the weekend. Do you think, as I do, that Joe Simpson is a better and more aggressive scrum half than England rival Richard Wigglesworth? He should have been used earlier. Hi Jonathan, Simpson doesn't work for Martin Johnson at the moment because Johnson doesn't trust what he doesn't understand. Simpson doesn't play in the structured way he likes and so it will take a bit of time for Simpson to break through ahead of Wigglesworth. Simpson will have to hope Sarries play badly and Wasps have a great season. In my book, Simpson posses more of a threat with his speed around the set piece and breakdown, but he needs to tidy up his game management. Jeremy, can I book the World Cup final weekend off work, Ireland are going all the way against Wales and then England, right? Hi Peter, the Rugby World Cup is about to go bonkers and it's brilliant that it's going to be a mini northern-hemisphere competition on one side of the draw. England, Scotland, France, Wales and Ireland will all be confident of beating one another. On current form Ireland look the team to beat. After Italy's solid performance against Russia, can you see them causing an upset against Ireland to throw Pool C wide open again? Hi Pipetto, in fairness Italy should have beaten Ireland in last season's Six Nations and had they done so I would have more confidence in thinking Italy could win this coming weekend against Ireland. The Irish are on a roll and I believe they will get the job done against Italy. How far can Wales go in this World Cup? Hi Michael, quite simply for me if Wales produce the form they showed against South Africa with a little bit of luck with the kicking and injuries then there's no reason why they couldn't make the final. It's a massive ask for Sam Warburton and a young squad but a good few of the Welsh squad have won a Grand Slam so won't fear the route to the final. ultimate impact player or wasted on the bench? Hi Andrew, Sonny Bill Williams is a good player improving every time I see him play. It will be interesting to see what he does after the Rugby World Cup. He hasn't decided whether he's staying in New Zealand or going abroad or possibly going back to Rugby League. In my book he has an impact in the game whether he starts or comes on as a replacement. In most teams he would start but the All Blacks have Conrad Smith and Ma'a Nonu who Graham Henry seems to prefer. I hope he stays in union, I guess if New Zealand win the tournament and he plays a part, then offers will come his way thick and fast and decisions will have to be made. Hi Jeremy, whilst it's great to see a diverse range of nations at the Rugby World Cup, I can't see what benefit Namibia, Romania and co gain from conceding 70+ points every game. Most smaller sides are no stronger now than they were 20 years ago. Do you think there's too many teams at the Rugby World Cup? Hi Paul, I disagree, there has been improvement and it's only been near the end of the pool games where the tier-two teams have taken a hiding from the bigger more professional teams. Romania and Namibia are still pretty much amateur and were always going to be under the cosh, but I don't believe it was a lost cause. Most of the tier-two teams came with a goal, be it to win a game, finish third, score a try against New Zealand etc. Ask any player, coach or supporter of Namibia or Romania if they want to be in the RWC and they will all say yes. These teams earned the right to be at RWC and the qualifying system as it stands looks good to me. South Africa have been performing well but under the radar. All the speculation is on the All Blacks and others. 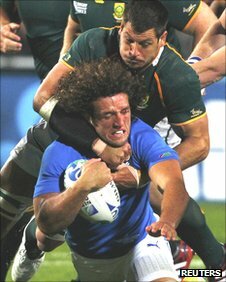 What chance do you give the Boks of defending their championship? Hi Princerooinek, South Africa look very good, they are in tremendous form but they could do without playing Australia in the quarter-final. If they get past the Wallabies and New Zealand they will win the final. If you were the 'prince of centres' then who was the king? Hi John, not many better than Tim Horan. Jeremy, why do you always use a slip knot for your scarf? Is it a specific rugby code? Hi Henry, I'm pretty sure it's a half Windsor.